It’s so nice to have a clean fridge! Thanks for the “challenge”! That’s a good question that I would like to know as well. We’ve done a variety of things over the years and we keep tweaking it as seasons change, so I’m afraid I can’t tell you the perfect system. 🙂 However, I would recommend checking out FlyLady.net and MotivatedMoms.com — two systems that have worked well for me at different times. 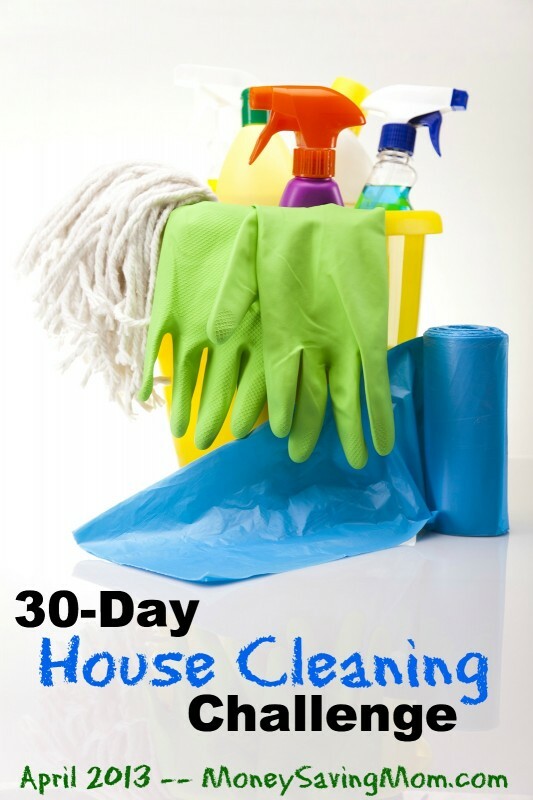 I think this list of chores we’re doing this month might be a good system for many people, too. Jessica, what works for me is to clean the refrigerator every Thursday. In my neighborhood, trash is collected on Fridays, which is why I do it on that day. Then on the weekend I shop for groceries for the upcoming week, and there’s plenty of room in the fridge for fresh food. I don’t empty the whole thing out. I work on one shelf at a time, look at each item and toss it if it’s expired or I think we won’t eat if. Then I wipe down that shelf, and move to the next one. Anything that is being kept I just pick up with one hand, wipe underneath it with the other hand, and set it back down. By doing this every week, it does not take long at all, maybe 10 minutes, and I never need to do a major clean-out of the fridge. I half planned to do the fridge only, not the pantry, but I pep-talked myself to starting only one shelf and ended up finishing two pantry cabinets as well. So glad to have this done! Thanks so much for your kind encouragement! I’m so glad you’re finding it helpful! It was nice to go through the fridge and clean. I didn’t have to much to get rid of but the drawers and shelfs definitely needed a wipe down. I already went through the pantry so that was good. This morning I commented the door on our second fridge had not been closed properly last night. Well it is dying. We have crammed our inside fridge full and our deep freeze. What a disorganized mess! Don’t know yet if we will replace it or not. It sure is nice to have a second fridge at holiday time and for stocking up. Done! It’s nice to have a de-leftover-ed fridge! The easiest time to clean the fridge is BEFORE grocery shopping. Now I’m ready to stock it up! My fridge is free of the unknown “something” in a Rubbermaid container now! Whew! Glad there was only one! 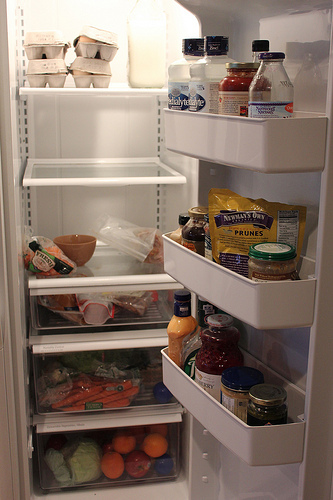 =) I love to open the fridge door and see everything organized and the shelves sparkling! Day #19 – done! The job of cleaning the refrigerator is one I never want to do. But I did tackle it today. I found a few thing lurking in there that I didn’t realize were in the fridge but now it looks really nice. I’m so glad to have it done. 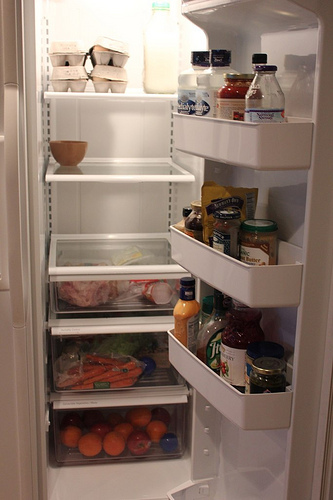 How is your fridge so empty? I feel like ours is always full even when there isn’t much food in it…and there doesn’t seem to be much I could clean out. Today, I worked on a HUGE project that I’d been putting off for a couple of months now. It took just about the entire day to get 85% of it done. Even though I didn’t finish the project, I feel hyped about seeing the progress I’ve made, so far. really stupid idea, to start cleaning the fridge at 20:30, wile dinner was at the stove…really stupid. Ate dinner at 22:00… stupid but done. Wow Crystal! My “after” is not even as clean and organized as your “before”. I joined this challenge just a couple of day ago. I haven’t even been able to do the challenge every day BUT I did do today’s challenge and feel good about it. The 2 days that I have done has made me want to continue AND catch up! Thank You! This was a very rewarding challenge! It feels great to have a somewhat-organized pantry. Bonus – I finally swept up the hundreds of sprinkles that have been hiding under the bottom shelf.